It is always a challenge finding new sports to cover, so I was excited to discover Motoball. 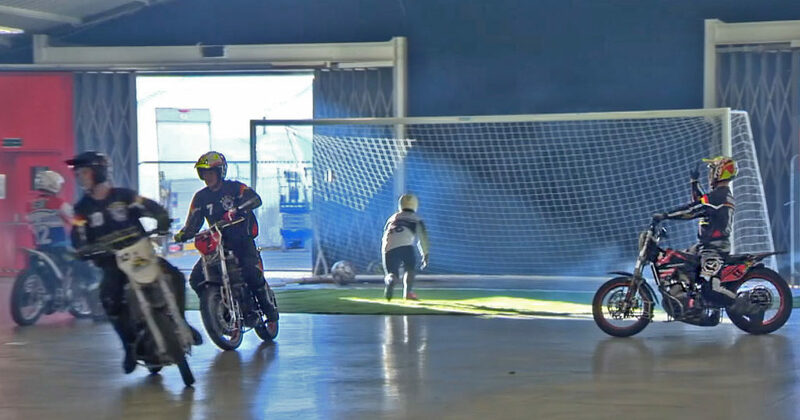 Put simply, Motoball is the game of football on motorbikes. In the UK there hasn’t been a team for nearly 50 years so UK Motoball hosted this exhibition match at the Dirt Bike show as a way to showcase the sport to drive a resurgence, recruit and build a team for 2019; The European Motoball Championship, to be hosted in Germany. 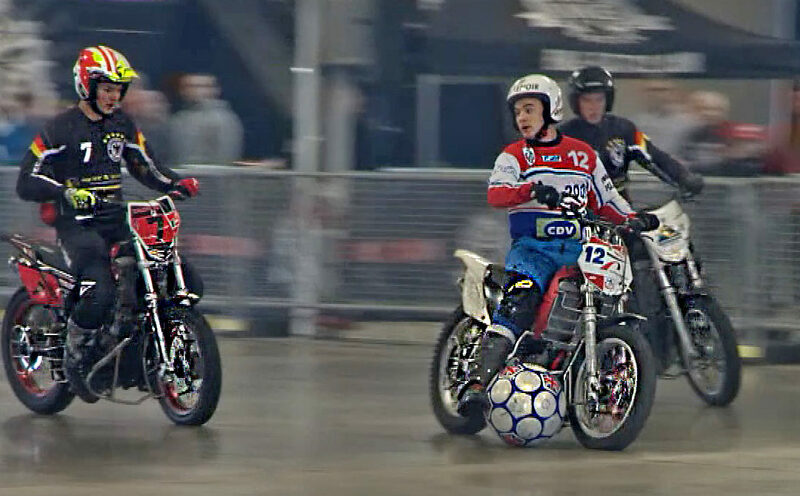 Whilst league, national and international matches are played on a full size football pitch, mostly outside, this exhibition match was played on an indoor pitch some half size, so play was restricted to 3 motorcyclists to each team with a goalkeeper who is on foot protected by a 6-meter D shaped area around his goal, this is off-limits to riders. Known as one of the fastest team sports in the World, Motoball is exhilarating to watch and is great for spectators. The riders accelerate up and down the pitch at speed; expert manoeuvrability skills, lightning-fast reflexes and nerves of steel are the keys to outscoring your opponents. The gear changes are controlled from the handlebar, leaving the feet to carry and control the ball. Contact is however an integral part of this sport but excessive force is managed using a traffic light system of cards by the referee, similar to ice hockey with varying degrees of time in a sin bin, or ultimately to be sent off. Camaraderie is a strong element of this sport off the pitch, but during games rivalry is fierce in the pursuit of goals and glory. With Motoball popular in many parts of Europe, it has a bright future. As a result of our news piece which on one platform alone got over 47 million views , UK interest has surged so it won’t be long before the UK once again finds its glory days. For anyone who is looking for an exciting Sponsorship opportunity NOW is the time to get involved, so please feed back any interest.